Grandad said "I've dug out the wooden box wireless for you. I don't think it will work now, but it was just the job in 1925 when hardly anyone had a wireless set. I made this one myself and really enjoyed it." Junior looked at the box and thought that it seemed rather as if someone had made it out of an old crate. "What did you make the case out of, Grandad?" he asked. "I don't remember now," replied Grandad. "It was some wood that I had around." They talked about the wooden box for a while, and Grandad explained that often sets were built on a wooden baseboard with a front panel often made of black ebonite, with no sides, top or back at all; the whole lot later being fitted into a box with no front to make it look tidy. "I wish I did that with this one," he said, "But Grandma wanted it to look better than my usual ones, and I thought it would be best to build it straight into the box. It was much harder doing it, though, because the sides got in the way. In the end I took them off while I wired it up." Junior wondered if the box had ever been shiny and polished. "I was going to polish it up," said Grandad, "But once it was working it seemed silly to waste time on the looks when I wanted to listen. Maybe we can do it some day?" But Junior disagreed. He thought that it should remain just the way that Grandad had made it all those years ago. "What are the knobs on the front for?" asked Junior. "From left to right," grinned Grandad, "They are: Tuning condenser, Fine reaction, Coarse reaction and Filament rheostat. Just above the knob for the tuning condenser you can see a small hole. This was a try at letting a disc on the condenser be seen. The knob worked in slow motion, and for every turn it flicked a little indicator to say how many turns had been made. But it is difficult to see the numbers through the hole." Junior looked into the hole and thought that Grandad was a bit hopeful if he thought that anyone could see anything at all! 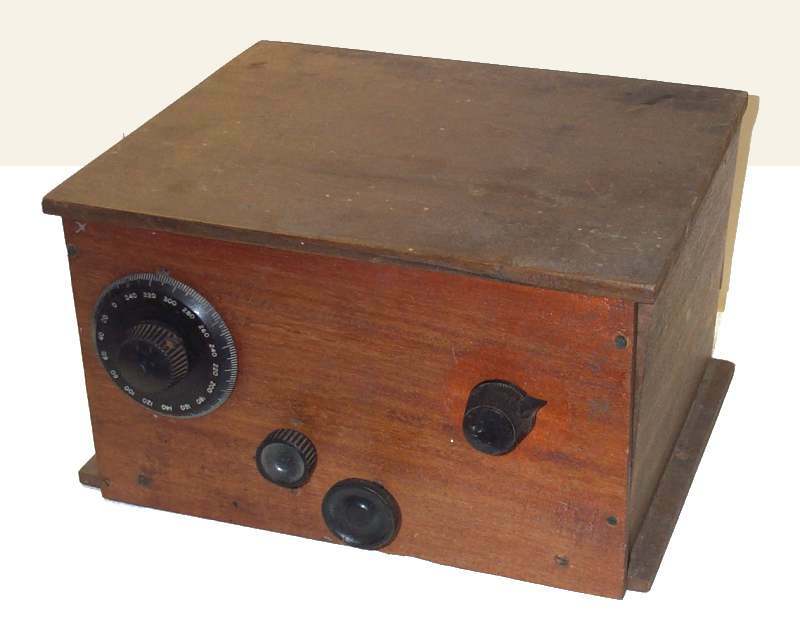 Grandad opened up the lid of the wireless, so that they could see inside. "This set had it's lid fixed on, not like the copper one, so the valve didn't get broken," he said. 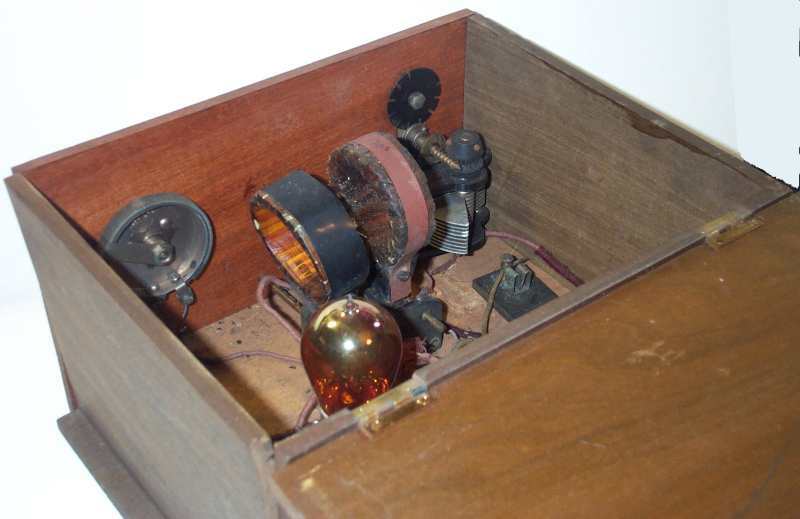 "This is a triode valve. 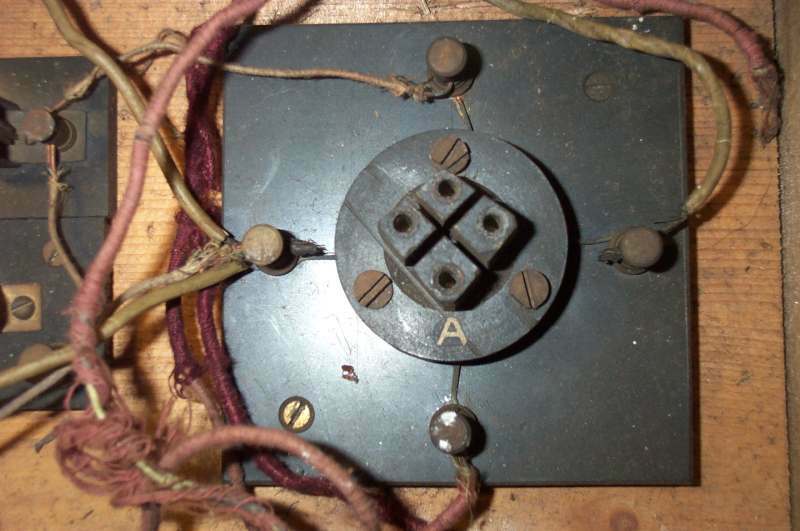 The filament rheostat that we saw on the front panel alters the current through the filament of the valve. This type, R5v, has a 5 volt filament, so we used a 6 volt battery and adjusted the rheostat to get the dimmest glow that still let the set work properly. That way the valve lasted a long time. At 5 volts it glows like a light bulb; really bright, but the filament doesn't last long like that. Valves cost much too much to waste." Junior asked about the two coils. "Why are they angled from each other?" he asked. 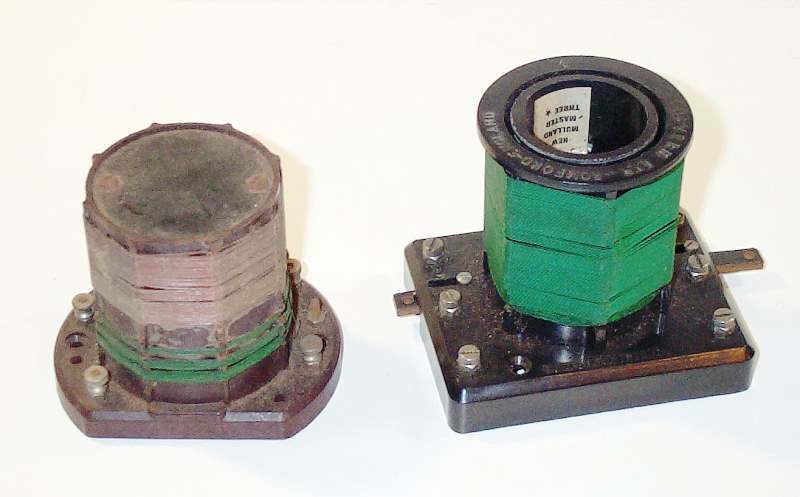 "They are mounted on a coupler that has two knobs at the front of the box. One knob moves one coil by swinging it about, the other has an eccentric cam that waggles the other coil gently to and fro. One of the coils is the main tuning coils and the other is used for reaction, to clarify the signal. 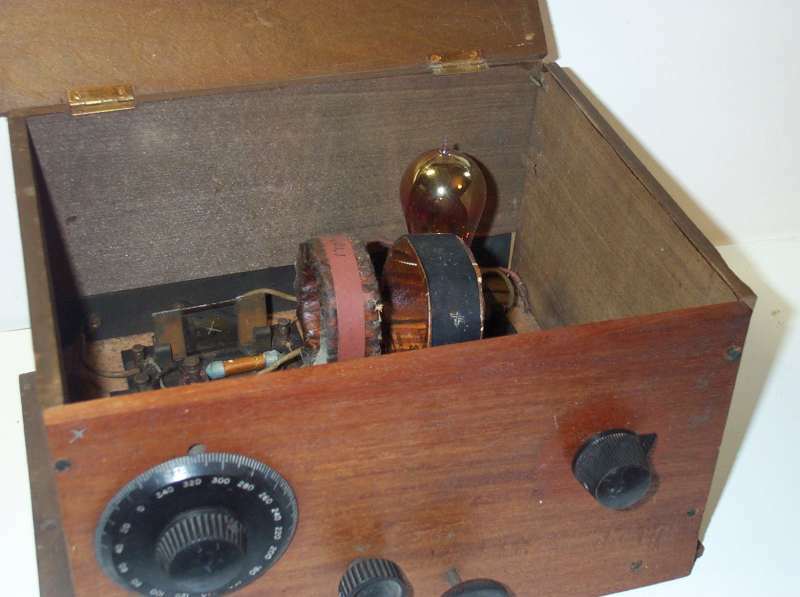 In later years we used a reaction condenser and fixed the coils, like you saw on the copper-box wireless. Both coils are plugged in, so that it is quite easy to select a pair of coils that do what you want." They played around with the two knobs and watched how the coils moved. "But doesn't that mean you need lots and lots of different plug-in coils?" asked Junior. "There's a whole box full somewhere," answered Grandad. "In those days we specified coils by the number of turns of wire on them. There were all sorts of styles. Some had two pins at the bottom, like the ones on this coupling unit, and some had a contact on each side, more like the grid leaks, to be clipped between spring contacts. Some we made, some we bought." "Later on, in the nineteen thirties and forties, it was all much more scientific and instead of having lots of choices of coils that we could try, we could calculate the number of turns that were needed and make or buy the right coil for the job. Not so much fun, though. "These days, you just buy the whole wireless, I mean Radio, and never think about how it works at all. They are so cheap, too!" Junior didn't say anything. He knew that Grandad was right; the fun of exploring Wireless was no longer there. People expected just to buy a sophisticated unit and listen to programmes. He thought for a moment. "Maybe one day we can build a wireless together?" he suggested. "That would be fun," said Grandad, "But you will have to do the wiring. My eyes aren't what they used to be." Junior wondered what Grandad's eyes used to be, but it made him feel giddy. He thought that perhaps Grandad's hands were not as steady as they used to be, either. Grandad said "If I rig up an aerial, we could build a crystal set together. That would be safe. These valve sets need batteries to work. Not only are they quite dangerous, but I haven't seen any in the shops for a few years." "When we looked at the wireless in the copper box, Grandad," he said, "You showed me the condenser that you made from mica and copper foil. Did you make parts of this set, too?" "Bless you, yes. Money was tight and we had to spend it on the bits that we couldn't make, like the valve and the tuning condenser," replied Grandad. For this set, I made the grid condenser and I even made the valve holder, and cut slots to separate the pins because the magazines said that it would improve performance." "Did it improve performance?" asked Junior.